Marketing to professional tradesmen is our specialty at Silver Lake Media Group. We have been honing our craft for 11-plus years. We are constantly modifying and updating our media tactics in response to frequent conversations with the Pros and discussing their media consumption and purchasing habits. No matter what part of the sales funnel you are addressing, we can build a plan to help you achieve your marketing objectives. Check out this short overview video for a recap of our offerings. Or continue reading for a an in-depth look at programs we offer and case studies. Contact us today to build a proposal for your consideration. Click here. Over the years, hundreds of tool and building supply manufacturers and retailers have trusted us to drive awareness and sales of their products to the Pro segment. See below for a sample list of marketing partners. Every marketing program we offer is in both English and Spanish. 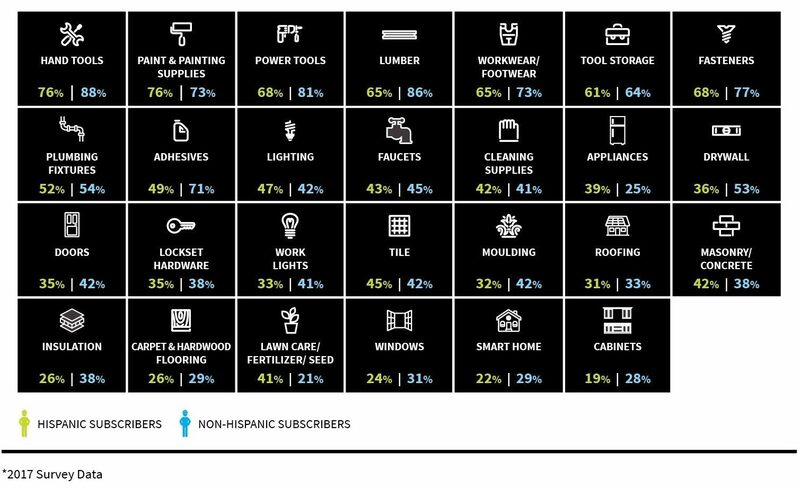 In the United States, if you are not marketing to Hispanic tradesmen who prefer to read and learn in Spanish, you are ignoring over 30% of the market. Every media purchase results in two ads – an English ad for the Pro Construction Guide brand and a Spanish ad for Constru-Guía al día. 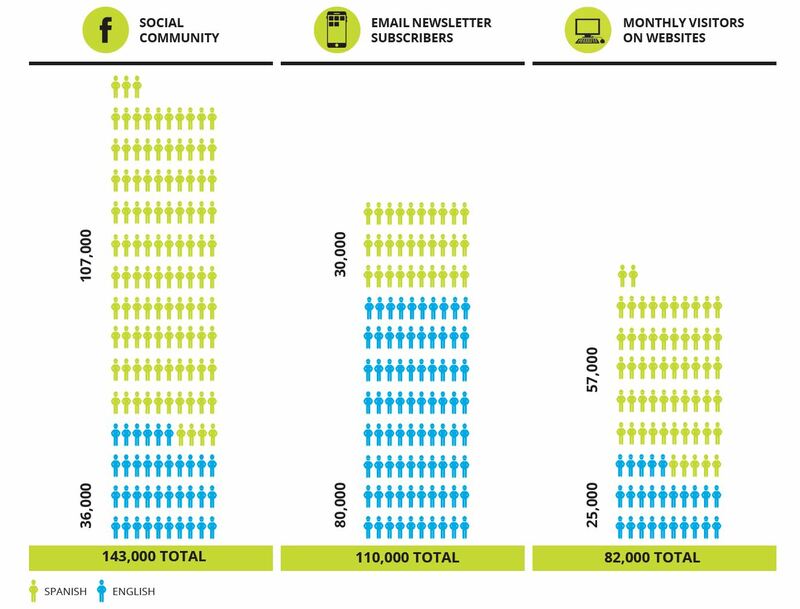 The bilingual database of subscribers and social followers is unlike anything in the industry. 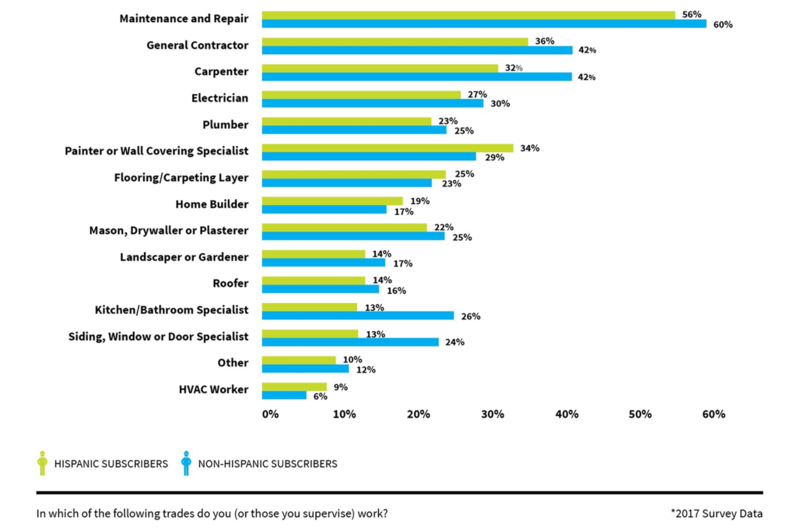 The breadth of trades represented in the community and their purchasing habits can be read in the following two charts. Our growing community of Pros seeking information can be reached through their social networks, email inboxes, videos and web searches. As a manufacturer, you can talk directly to Pros with one or a combination of platforms. No matter what trade you are trying to reach, a digital program with Pro Construction Guide/Constru-Guia can reach your target. We leverage email to reach our Pro community of over 100,000 subscribers on a weekly basis. Marketing partners can sponsor the entire email and control the messaging in a Product Showcase. 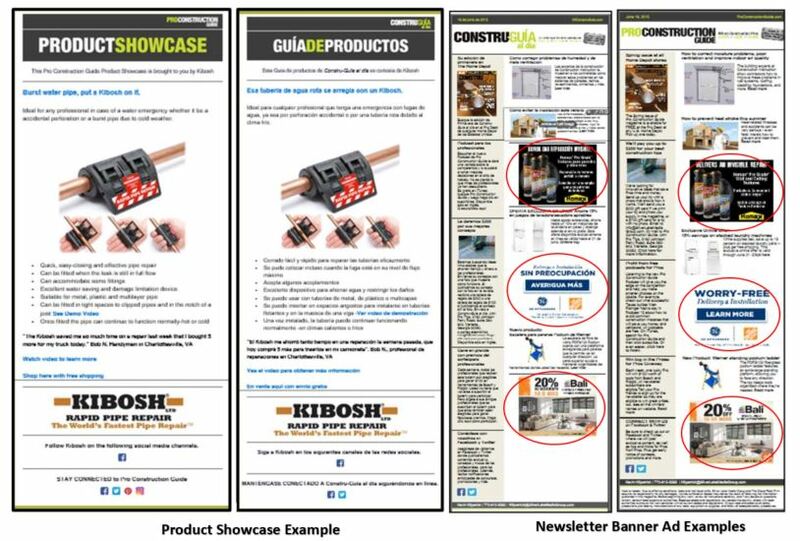 An alternative to a Product Showcase is a banner ad in our newsletters that can be linked to your site, YouTube or a retailer/dealer. Additionally, sharing the Product Showcases on Facebook has proven to be an impactful method to extend reach, as can be seen here in the Kibosh Case Study. Click here to see the Kibosh Case Study. 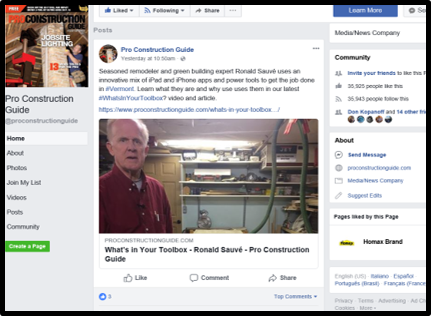 With 143,000+ Facebook total followers on Pro Construction Guide and Constru-Guia, social media is a quick and effective means to get your message in front of your target. We can post videos, Product Showcases or simply share your posts with our community. Field Tests are a direct result of a Pew Research study that found 90% of Americans trust peer recommendations and 84% take action based on the opinion of others. 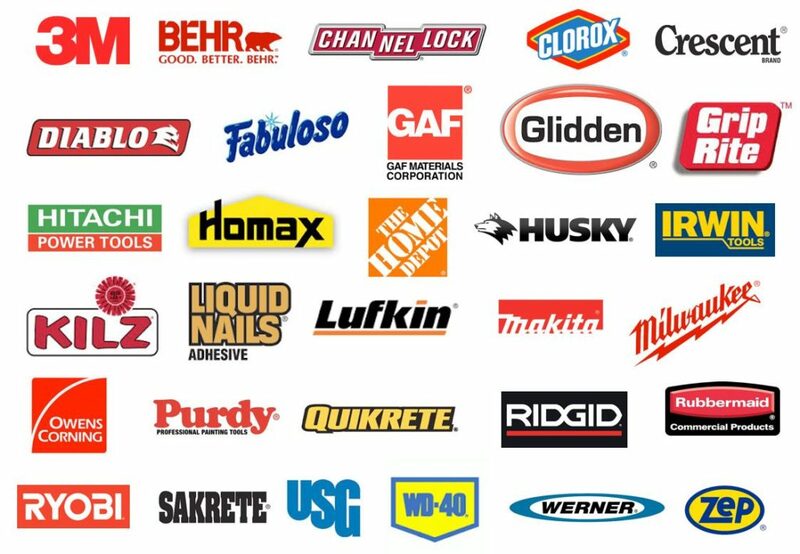 In our Field Tests, we send your tool or building supply product to a handful of our trusted and vetted Pro Construction Guide/Constru-Guía Advisors. The Advisors will use your product for three weeks and provide a written report and a video of their thoughts of the product and how it performed on their jobsites doing everyday tasks. The reports and videos are compiled into a single article and video and emailed to the 100,000+ subscribers, posted on social platforms and featured on both websites. 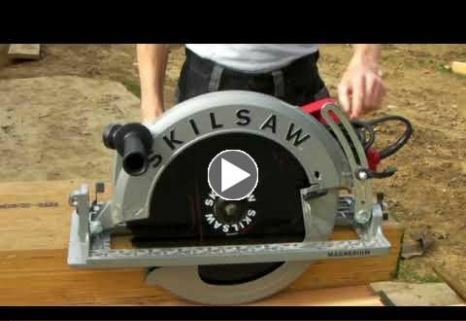 Check out the RIDGID Compact Table Saw Field Test in English here and in Spanish here. The case study for the Field Test for RIDGID can be read here. Interviews with Pro Construction Guide and Constru-Guía Advisors where they share their favorite tools. This video and written article series has separate executions for English and Spanish executions. But they are sponsored as a pair and both promoted to email subscribers, social followers and have a dedicated channel on both websites. 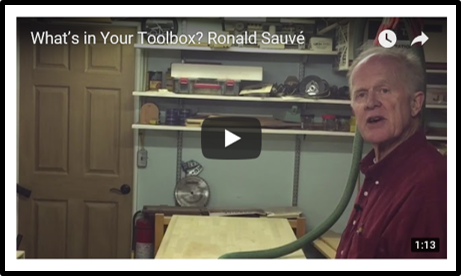 In-depth, long-format tool video reviews by veteran tool journalist Michael Springer. Michael goes in-depth on what he likes and doesn’t like about new tools hitting the market. Videos are produced in English and Spanish and distributed to email newsletter subscribers and social followers, and posted on dedicated channel on both websites. Click here to access a sample Video Tool Review Sponsorship page. Approximately 82,000 unique visitors per month stop by ProConstructionGuide.com and MiConstruGuia.com to read the library of 920 unique articles. There are plenty of sponsorships and advertising opportunities for you to consider. Custom research projects can be executed to give you, the end user, insights you need for product development or marketing. The Constru-Guia brand is growing rapidly in Mexico. Contact us today to find out how you can reach Pros in Mexico with email newsletter sponsorships and Field Tests. To learn how Pro Construction Guide/Constru-Guía can drive your sales, contact Kevin or Lisa today. For more information on Silver Lake Media Group, click here.